Not only does the iLoud live up to the promise of its name, it successfully moonlights as a portable music studio. IK Multimedia makes a host of cool iOS accessories – most of them geared toward musicians. The company’s growing stable of apps and hardware can help turn a standard iPhone or iPad into a powerful field recorder, a miniature studio mixer, or even a motion-controlled DJ platform. So when the company set its sights on a Bluetooth speaker, we knew it would amount to more than just your basic portable sound machine. 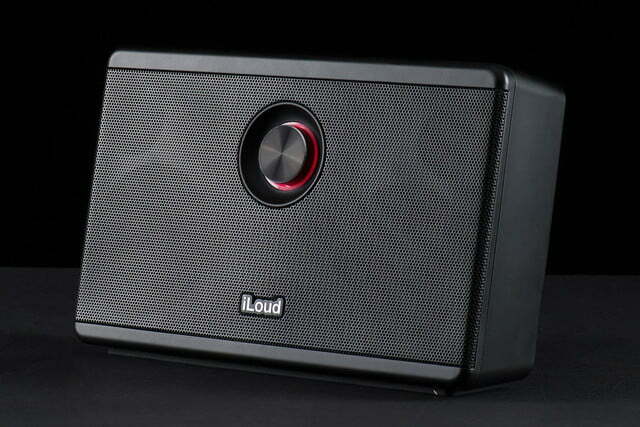 Dubbed the iLoud (and for good reason), IK’s latest is part Bluetooth speaker, part PA system, and part studio monitor. Aimed squarely at musicians and audiophiles, the $300 speaker streams music wirelessly and, when combined with an iOS device and any number of different apps, proposes to replace guitar stomp boxes, keyboard patches and stand-alone effects boxes. That sounds great, but does it work out well in practice? We found out. For all its promise, the iLoud looks pretty unassuming. What we pulled out of the box was an all plastic rectangular cabinet with no real stand-out features, save a metallic volume dial sunk into the center of its front face. The exterior feels solid and looks sleek enough, though touching the matte surface showed oily marks as if our hands had been marinating in a Cheetos bag. 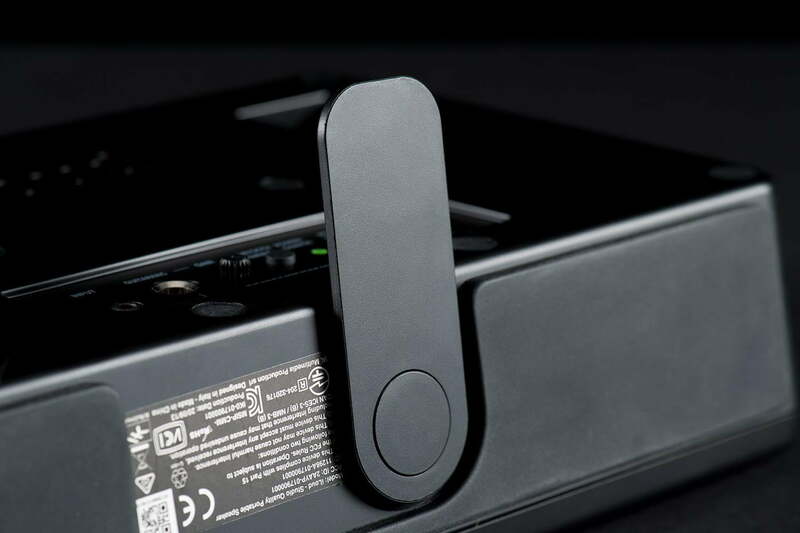 A soft rubber pad along the bottom keeps the unit steady on slick surfaces, as does a little rotating kickstand, which allows the iLoud to lean back at a gentle angle with confidence. 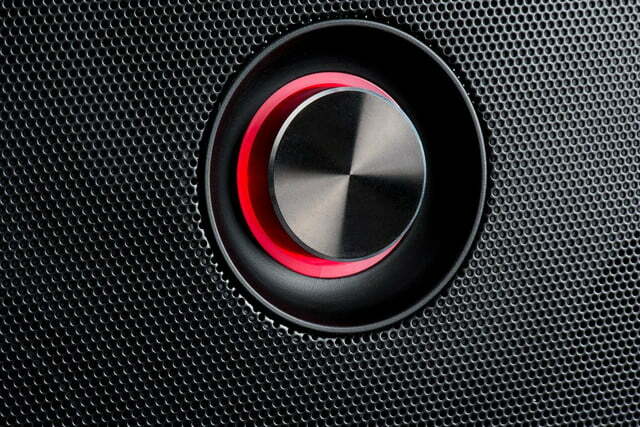 Eyeing the backside of the speaker revealed the first telltale signs that iLoud is no ordinary Bluetooth device. 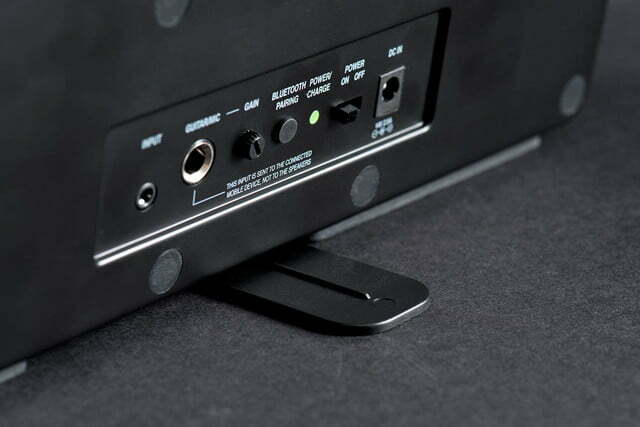 Below a small bass port we discovered a collection of controls and inputs, including an 3.5 mm jack for connecting a smartphone, a ¼-inch input for mic, guitar or keyboard cables, and a small input gain knob. Also along the panel were more familiar features such as a Bluetooth pairing key, a power switch, and a DC adapter input. Accessories in the box included an ⅛-inch TRRS cable, a power supply an IEC cable, and a set of instructions. At about 3 lbs.,the iLoud rests relatively heavy in your hands, but it’s compact enough to haul with you just about anywhere you might go. 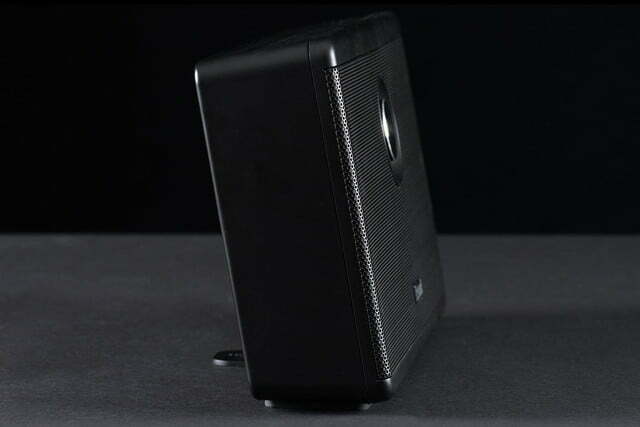 The speaker’s dimensions are approximately 6 inches wide, 10 inches high, and around 2.5 inches deep, allowing it to fit easily into a backpack or gig bag. Beneath the iLoud’s hard plastic shell rest four individually powered drivers, including two ¾-inch tweeters, and a pair of 3-inch midrange drivers. Those little drivers can be deceptively powerful, however, thanks in no small part to the system’s densely-packed Class D amplification, which sends 4 watts to each tweeter, and 16 watts to each of the larger drivers for a total of 40 watts RMS. IK claims a 50Hz to 20kHz frequency range for the system, but we never heard it get within a stone’s throw of that lower number with any authority. At about 3 lbs., the iLoud rests relatively heavy in your hands, but it’s compact enough to haul with you just about anywhere you might go. An LED at the back of the device turns from orange to green when the system is charged, and glows red when it’s time to plug in again. The battery provides a claimed 10 hours of portable playtime at “normal” volume, though it will burn through its charge faster at higher volumes. To save energy, the system goes into auto standby mode when at rest for a period of time. The shiny infinity dial at the front of the iLoud gives a satisfying click with each increment of volume adjustment. A band around the dial lights up red when the speaker is powered on, and blinks when max volume has been reached. The small gain dial at the back cranks up the microphone or guitar input. All other controls are handled by your iOS device. IK doesn’t disclose which Bluetooth profile the iLoud uses, leading us to believe it may be an older version than Bluetooth 4.0, as that version is often a selling point. The speaker also made a fair amount of connection noise when paired, but we’ll get into that more in the performance section. The speaker can pair up with two devices at a time, allowing you to easily switch back and forth between transmission devices. 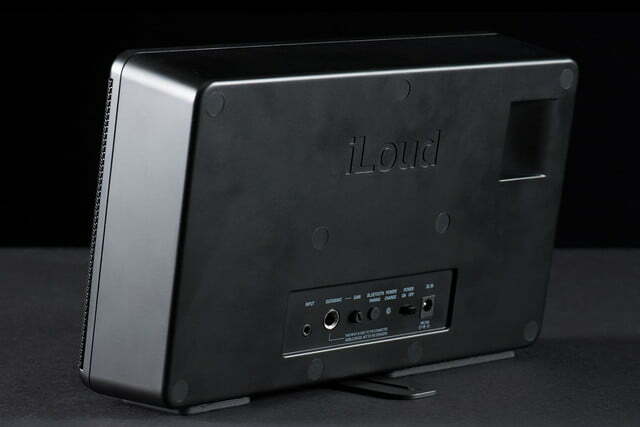 The iLoud accomplishes its amp modeling by incorporating IK’s iRig circuit inside the box, which allows for real-time processing of sound through your iOS device. You’ll need to download one of the hefty amp modeling applications (around 250MB) onto your device before the system can work its magic, however. The speaker and mobile device then work in tandem, allowing for easy touch control of all digital parameters, with no audible latency. Companion apps like the VocaLive PA modeler, or the AmpliTube guitar amp modeler are available in a free version, but they’re pretty rudimentary, offering only a tantalizing peek at what the app is capable of, while preserving most of the features for the paid version. Needless to say, if you’re a musician planning on rocking out the iLoud’s amp feature for any length of time, you’ll want to pony up the $20 for the real deal. Doing so will get you a host of included FX plug-ins, and often fully functional recording software. There are also reams of plug-ins available to purchase “ala carte” for around $3 to $8 each, setting the hook in if you’re a constant experimenter. Setting up the speaker for Bluetooth streaming is as simple as powering the device on, pressing the pairing button at the back, and then locating it in your mobile device’s Bluetooth settings. You can also play back audio from non-Bluetooth sources using the included ⅛-inch TRRS cable. To play around with the amp-modeling feature, you’ll need to first download one of the available apps, such as the VocaLive, or AmpliTube apps mentioned earlier. Once you’ve got your app installed and running, you can plug your mic, guitar, or other instrument into the ¼-inch input. There is no included XLR input, so if you’re using a mic you’ll need to buy an adapter or an XLR to ¼-inch mic cable. You can also simply use a DJ-style app to play or record software instruments. The next step is to connect the ⅛-inch cable from your iOS device’s headphone output into the speaker’s input. If you’re using an instrument or mic, you should now be able to see signal coming into the app. The manual says to bring up the gain knob at the back of the speaker to the highest level without distorting, but we cranked it up all the way with no issue. Then simply adjust the speaker’s volume, and you’re officially ready to rock. 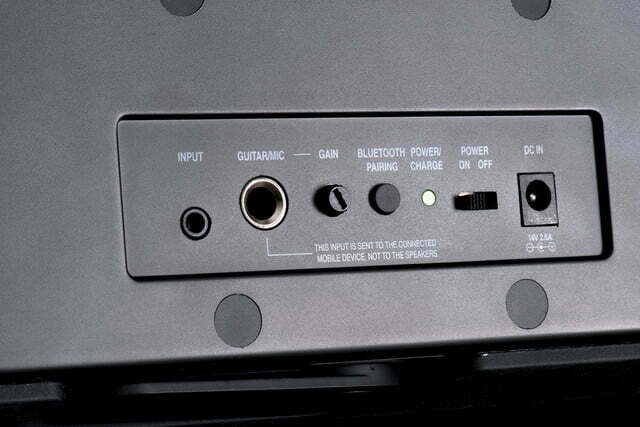 The first thing we noticed when pairing to the speaker via Bluetooth was a prevalent whining noise that started upon connection. We tried both our iPhone 5 and our old 3GSs, connected and disconnected several times, but the noise returned each time we linked up. The sound was fairly well masked during playback, but it was always there behind the music, and that’s a problem. 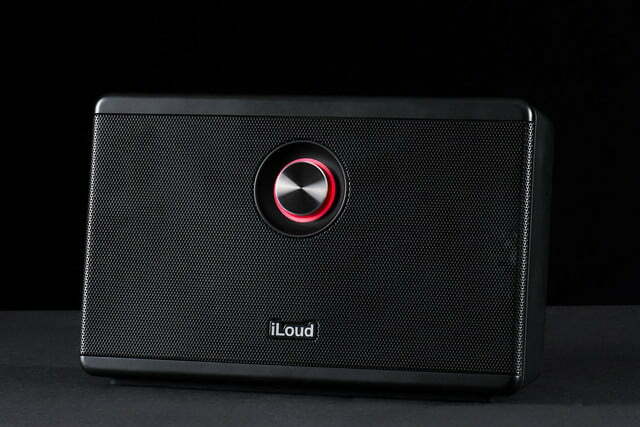 Ignoring that hiccup, the most notable thing about the iLoud is outlined in its name: iLoud – more like i really loud. IK Multimedia claims its device is two to three times louder than most speakers its size, and we’ve totally got the company’s back on that one. The speaker can blast out tunes with the potency of a bathroom hand dryer, screaming with enough force at max volume to be too loud even from another room. We thought we heard some minor distortion occasionally at full throttle, but since we had to back away, it was pretty hard to decipher, and not of any real issue. The sound itself was detailed, and vividly clear – almost too clear, at times. To use a guitar term, the sound curve was much more Telecaster than Strat. The midrange and treble rode at the front, unleashing firm cuts that made snares snappy, and hi-hats jingle like a 60’s tambourine. The hottest tracks we auditioned were a bit much. Still, on more balanced tunes, ride cymbals were smooth, and midrange-intensive instruments like guitars, organs, and synthesizers were pristinely separated, and defined with the eloquence of a fine sculpture. The detail and breadth definitely didn’t reach studio monitor quality as IK claims, but it was impressive nonetheless. We got better balance by employing a wall as a boundary, which warmed things up in the bass and lower midrange a bit, and also brought about a wider sound stage, thanks to all the reflections. Auditioning Jay-Z’s “Allure,” we heard rich bass lines and some rumble in the kick drum, while the instruments were flung out wide to the periphery of the small cabinet. And the Decemberist tune, “The Landlord’s Daughter” sounded full, with some nice punch down low, and a crushed thump in the snare. The sweep of the B3 towards the end of the song seemed to wash across the soundstage like the crest breaking on a large tube wave, accenting the system’s ample stereo spread. We tested the amp modeling facet of the iLoud with the AmpliTube app, our iPhone 5, and a Stratocaster-copy Hamer electric guitar. After the burly swath of sound that erupted from the speaker during our Bluetooth evaluation, we were happy to discover the speaker was able to push out almost as much power on the amp side of things. While the system won’t replace your regular guitar rig, it definitely reaches above the levels you’ll find in most practice amps its size — and it’s portable. Midrange-intensive instruments were pristinely separated and defined with the eloquence of a fine sculpture. It was pretty fun playing around with the system, both at home and on the go. One of the most important factors in summoning creativity is having the tools of the trade present when inspiration strikes, and with the iLoud’s portability, you could bring your guitar rig, beat machine, or mixing station just about anywhere. Moving around in the AmpliTube program was relatively easy on our iPhone, and with an iPad it was even more accessible. We also had zero issues with latency (thanks to a wired-only configuration), able to rock out effortlessly without the problems that sometimes arise when instruments are filtered through ones and zeroes over a mobile device. We were able to change up the tone quickly with the sweep of a finger by adding different plug-ins, or cranking the gain and EQ back and forth to raise or lower distortion. We did wish for more variation in the tone overall though, and even when we messed with the amp parameters, it didn’t react as dramatically as a real amp. Still, there are plenty of different apps and plug-ins to alter the iLoud’s sound, and the collection will likely only expand. 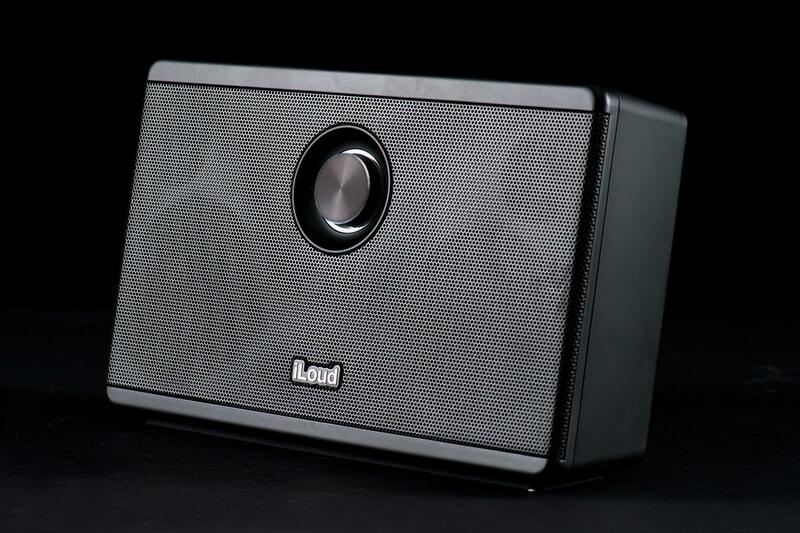 IK Multimedia’s iLoud is helping to redefine the genre of portable speakers. The unit stumbles here and there in its ambitious quest for affordable versatility, most dramatically outlined by the excessive noise we encountered while connecting via Bluetooth. That said, its ability to play back music with brilliant detail at a massive volume, paired with its enormous potential as a creative tool, will make musicians and music lovers alike want to give IK’s iLoud a good look.